Irish Record 8.28 lb taken on 28.09.1983 by Edmund Cull at Cork Harbour. This species is also commonly known as the Spotted Ray. It is diamond shaped, and the wing tips are almost formed as right angles. The under-side is light, creamy coloured, the top-side is sand or tan with numerous darker spots and on occasion, larger light coloured spots, ringed with small dark spots, similar to Blonde Ray, which it is sometimes confused with. However, the spots on the Homelyn Ray do not extend to the wing tips, whereas the spots on the Blonde Ray will reach the wing tip extremities. 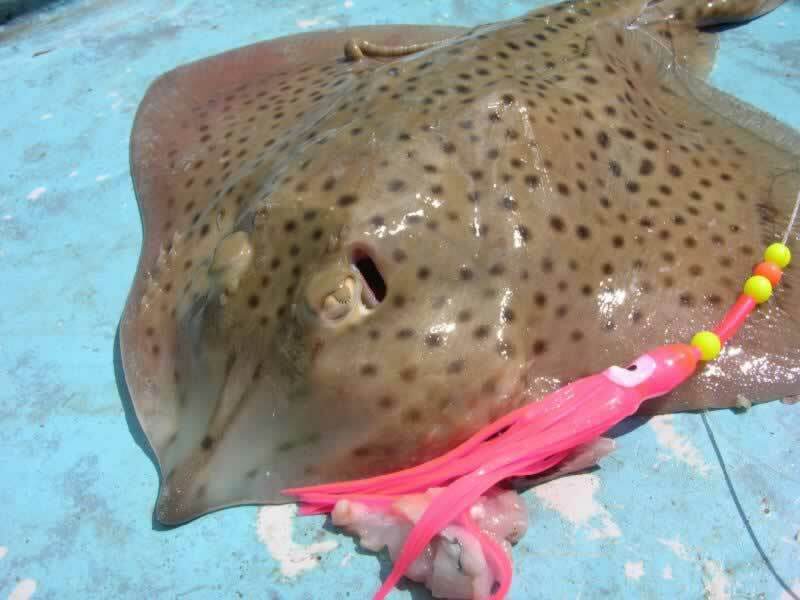 Also known as Spotted Ray, this is another of our smaller ray species. It often inhabits the same under-water terrain as Cuckoos and Blondes. I noticed on some sand banks on the Causeway Coast, that although areas held different ray varieties, the Cuckoos seemed to prefer one particular area of the bank, the Blondes another, and the Spotted in their separate area, but all within a few hundred yards of each other. Over a few seasons, we had this pretty much “nailed” down that we were able to hand pick a ray species. This continued until local scallop dredgers worked the area and I have been un-able to target any rays on this mark since! The sloping banks and gullies out of harbours along the Antrim Coast will produce Homelyn Ray, as will many similar banks around our Irish in-shores. Notable areas are Cork Harbour, Killybegs, Caherciveen, but most specimen fish now come from marks out of Castletownbere. As with most of our Ray species, the season runs from spring through to late autumn. Mackerel strip or fillets is the top bait, but Homelyn Ray are also temped quite often with cocktails of mackerel, Sand eel and Squid, and on occasion, peeler crab. Usually a slow drift along sections and slopes of off-shore sand banks will sort out this ray species. A long flowing trace, with a sonar spoon just ahead of the hook-bait always worked well for me. The spoon acts as an attractor in several ways, from the flash of silver and streak of colour, to raising the occasional “puff” of sand. I also believe the added weight and shape holds the bait closer to the sea bed, flicking it up every now and then, giving the bait a little “life” to tempt a wary predator.